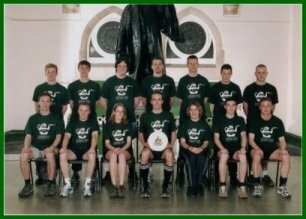 Set up in 1996 by Alex Evans (Welshy) Mwnci See became the first ultimate team from Wales describing ourselves as a bunch of good natured, mud loving people who eat, drink and breathe ultimate and beer. Mwnci n. [pl. -iod] A mwnci is a young, short-sighted, daft earth dwelling organism. It survives by eating and drinking almost anything, from marzipan to vodka, from bananas to tequila. In order to successfully befriend and tame a mwnci, one must throw circular objects to [or at] it. A mwnci will usually throw said object back. If it doesn’t, poke it. It will then drop what it is carrying and run. A far more effective technique is to buy said mwnci an alcoholic beverage. So adopt one today, and help a mwnci see! Ultimate is an extremely dynamic non-contact team sport played which can be played inside or out. Comparisons to other sports, despite being regularly attempted, are not really possible. Men and women play together on the same teams, it is played with a flying disc, and there are no referees. Instead players call there own fouls, and sort disputes out amongst themselves in a spirited fashion. Spirit is perhaps the most important aspect of Ultimate and at tournaments prizes are awarded not just for how well the team does but also for spirit! If you need more fun and entertainment then you should look for the best sports betting sites for the current year and pick the most suitable for you.